As the Toronto Blue Jays open their 2010 season they’re in the midst of some of the lowest attendance ever recorded. 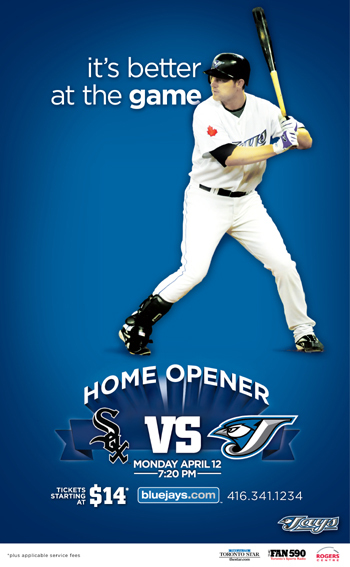 Before the season began, Publicis created a new advertising campaign to promote the 2010 Toronto baseball season. Publicis creative director Pat Pirisi says the campaign aspires to fill seats and motivate Jays fans to experience a game first-hand. The print ads began to rollout – simple, predominantly blue, with soft variations in intensity – depicting players in dynamic poses. The one below with the phrase “it’s better at the game.” These ads are simple, sleek and provide all the relevant information to attend a Jays game. In addition to the print ads, Publics Canada created commercial spots featuring larger-than-life-birds wearing suits, sitting in a boardroom and trying to come up with gimmicky ideas to attract fans to Blue Jays baseball games. In one of the ads, one of the birds throws his feet onto a table to show off his latest idea — foam feet. In another spot, one bird says that the team should offer hot dogs at the ballpark. Yes, both the television and print ads convey the message that baseball is great live. But neither tool conveys the message in a way that would bring people to a baseball game. The television ads are creative and funny. This isn’t a YouTube campaign, where people will laugh, snicker, then forward the video along to a friend. It’s a campaign to fill seats at the Rogers Centre. The Jays were once firmly entrenched in the Toronto sports-landscape during the early 90’s. 15-years-ago the Raptors burst onto the Toronto sports scene and now Toronto FC is building momentum and developing a strong fan base in the city. To fill seats for baseball in Toronto, you have to first build baseball into the culture of Toronto. This brings to mind the speech “People will Come” from Field of Dreams. The Blue Jays need to build on the passion, tradition, and magic of the game of baseball – build it into the culture of fans – not as a parting after-thought. These gimmicky television spots do nothing but reinforce the belief that the Blue Jays are grossly out of touch with their fans in Ontario. The message is right; it’s better at the game, but the Jays missed on their delivery. Build on the excitement, thrill, and joy that comes with attending a Jays game, not life-sized blue jays scheming up bird-brained ideas to fill seats in the Rogers Centre.